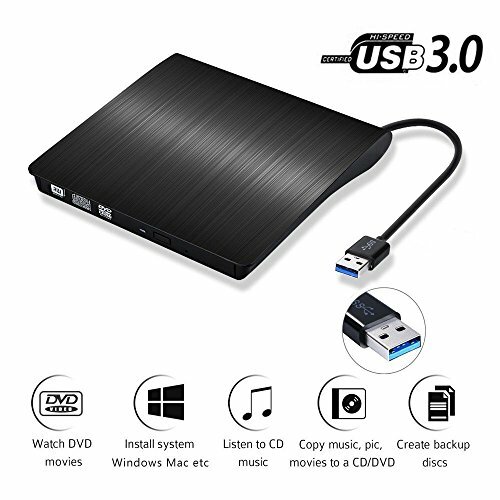 With Wahom External CD Drive Fast Essential USB3.0 CD/DVD drive burner, you can watch DVD movies, burn files, movies to a CD/DVD, install software and create backup discs etc. NOTE: Customer's using Windows 10 are advised to Install VLC Media player to Play DVD and CD. EASY TO INSTALL and USE: Plug & Play External drive is unnecessary, Data can be easily transferred just by inserting the USB cable. Power can be provided with the USB port of the personal computer. Even those who are not familiar with PC can easily use. It is indispensable for a PC without a CD-ROM drive. USB 3.0 - HIGH SPEED INTERFACE: It comes with standard USB 3.0 transmission which provide faster data transfer rates. Pure-copper-knitted-net tech leads to smaller resistance, stronger shielding capability, more stable data transmission. It is backwards compatible with USB 2.0. GOOD COMPATIBILITY: Plug and play on most laptops or desktops running Windows 10, 8.1, 8, 7, Vista, XP, Linux and MAC 10 OS system. * Do not recommand Surface pro laptops because of its low power of USB interface. * Not compatible with higher version than Mac OS X Yosemite 10.10.4. 100% RISK FREE PURCHASE: Wahom CD Drive with voltage stabilization system, Avoid high or low voltage lead to the drive can not use or damage the computer.100% brand new DVD loader. High quality with 12 months product warranty, 30 days product replacement or refund if you are not satisfied. If you have any questions about this product by Wahom, contact us by completing and submitting the form below. If you are looking for a specif part number, please include it with your message.